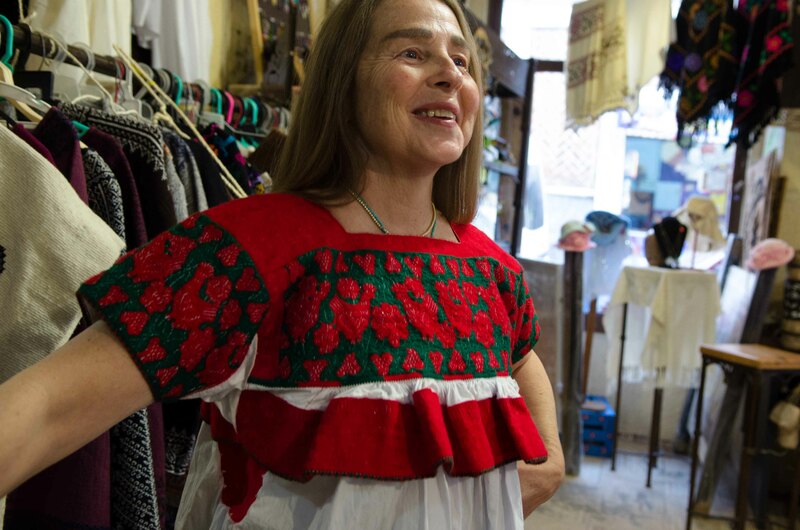 After landing in Mexico City, taking the Estrella Roja bus (complete with WiFi, TV, and reclining seats) from the airport to Puebla, and a good night’s sleep, I set out to find my favorite folk art shop Siuamej, only to discover that they moved. First and foremost, here is the address: The corner of 4 Oriente and 4 Norte. 4 Oriente is the street of the camote shops. Puebla streets are confusing** and I got turned around and lost trying to find the new location. But, when I got there — WOW! 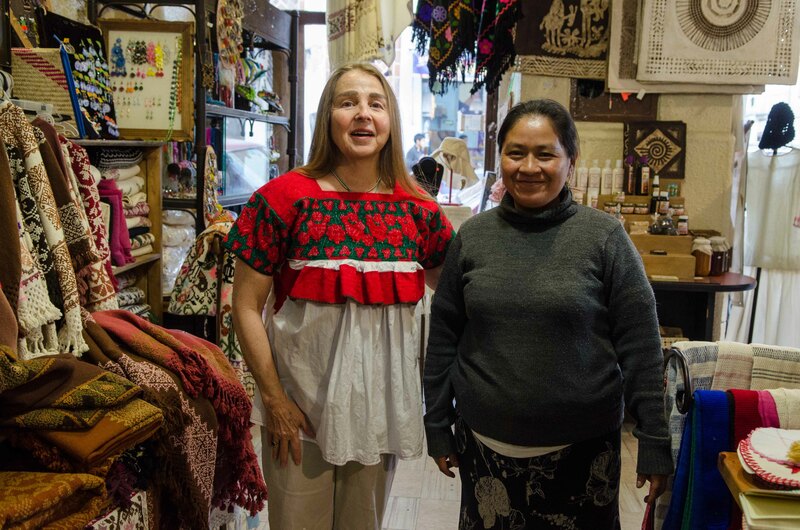 Siuamej is an indigenous arts cooperative that represents the work of artisans from throughout the remote Nahuatl-speaking mountain region which is a good three to four hours by bus from the city of Puebla. Within moments of entering the shop, Kit Rank showed up. She is a New York City artist represented by McKee Gallery who has been living with her husband in Sicily for the last ten years. They have been living in Puebla now for a couple of months and love it. 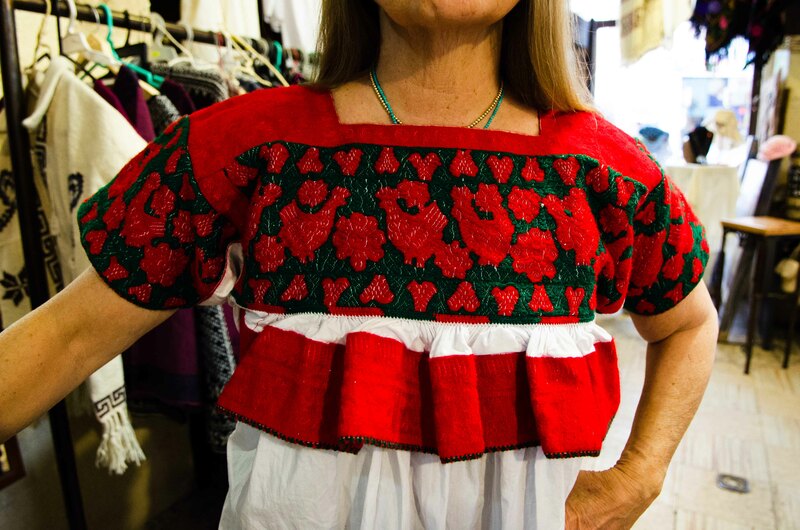 She had her eye on an exquisite hand-embroidered top that we convinced her to model. She bought it on the two-month layaway plan! 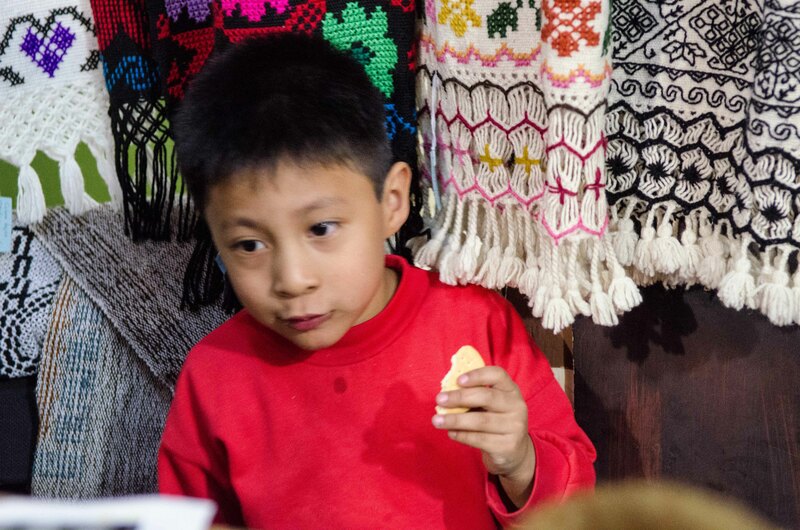 While Uriel, son of shopkeepers Mari Jimenez Barbara and Tomas Amaya Aquino amused himself with Sponge Bob, I looked through the all naturally dyed wool quechquemitls and rebozos, settling on a Chal de Hueyapan handwoven by Teresa Lino Bello, dyed with baseide sauco (elderberry plant dye) that yields a stunning olive green (see photo above of the three shawls). 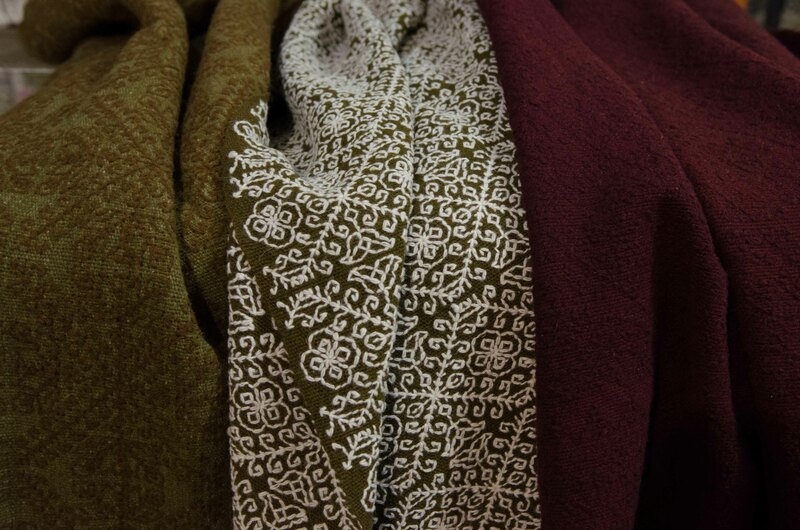 The hand spun yarn that is used for the embroidery is dyed with nogal (tree bark) and the brown embroidery on the green provides a subtle contrast. The fringes or punto are hand tied in a style called doble vista. In addition to the handwoven wool textiles, there is a selection of jewelry, baskets, embroidered cotton blouses, ceramics and lots more. 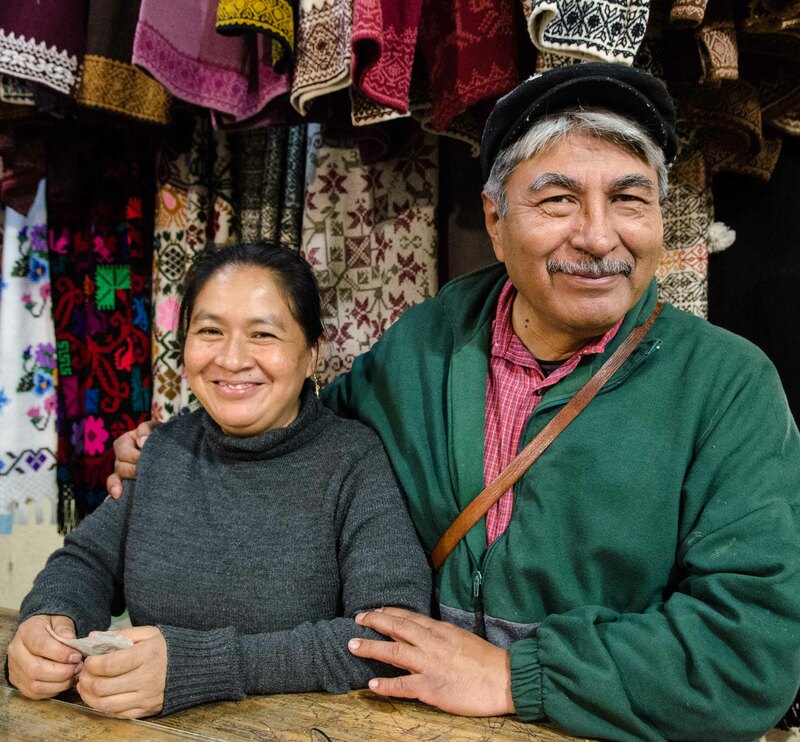 Tomas speaks English very well (he is originally from Oaxaca), and it is easy to be in discovery of Puebla’s indigenous artisan riches for well over an hour. This is the only artist cooperative I’ve been able to find in Puebla. Here you know you are buying the best quality available and the funds go directly to the makers at fair trade value. **Puebla streets are arranged in a quadrant — north, south, east and west. Odd numbers go in one direction, even numbers go in the other direction. Get a map from your hotel or the tourist office on the Zocalo before you set out. It is really confusing. Especially since oriente translates to east and poniente translates to west. This entry was posted in Oaxaca Mexico art and culture and tagged fiber art, Mexico, Oaxaca, Puebla, textiles. Bookmark the permalink. Are you en route to Oaxaca and Teotitlan del Valle? Please let me know when you’ll be there as I have a friend who will be visiting Oaxaca soon and i want to tell her about you and your work. We had to postpone our trip to Mexico this Feb. as Bruno had knee replacement surgery and won’t be 100% for a few months. We plan to come to San Cristobal and Oaxaca Feb. 2014 and would love to see you in Teotitlan del Valle then. We just spoke to Chris and David Reese who are leaving for Bela’s at San Cristobal on Wed. Will you be going there this year?